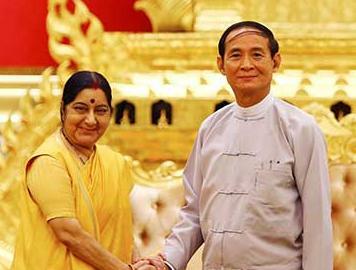 Union Minister of External Affairs, Sushma Swaraj is on a two-day official visit to Myanmar. She reached Myanmar’s capital city Naypyidaw on 10th May 2018. Sushma Swaraj received a warm welcome by India's Ambassador Vikram Misri and Permanent Secretary of Ministry of Foreign Affairs of Myanmar U Myint Thu. Sushma Swaraj during her visit met Myanmar’s President U Win Myint, and State Councilor and Minister for Foreign Affairs Daw Aung San Suu Kyi and the Commander in Chief of the Myanmar Defence Services, Senior General Min Aung Hlaing. India and Myanmar representatives signed seven Memorandum of Understanding (MoU) and Agreements in the presence of Indian Minister Sushma Swaraj and Myanmar's State Counselor, Aung San Suu Kyi on 11th May 2018 in Myanmar’s capital city Nay Pyi Taw. A MoU on Restoration and preservation of earthquake Damaged pagodas in Bagan, Myanmar. A MoU on the training of Myanmar foreign service officers. A MoU on setting up industrial Training Center (ITC) at Monywa, Myanmar. An Exchange of a letter on extending a maintenance contract for ITC Myingyan, Myanmar. EAM Swaraj’s visit was a part of the ongoing high-level interaction between the Governments of India and Myanmar. Sushma Swaraj also welcomed & offered support/cooperation Myanmar’s decision to implement the Rakhine Advisory Commission's recommendations for ‘Rohingya Muslim Issue’.